Christian Nevils and his mother, Annette, are direct descendants of a slave family at the Carter House. They say markers would show African American residents in Franklin they aren't overshadowed by the Confederacy. 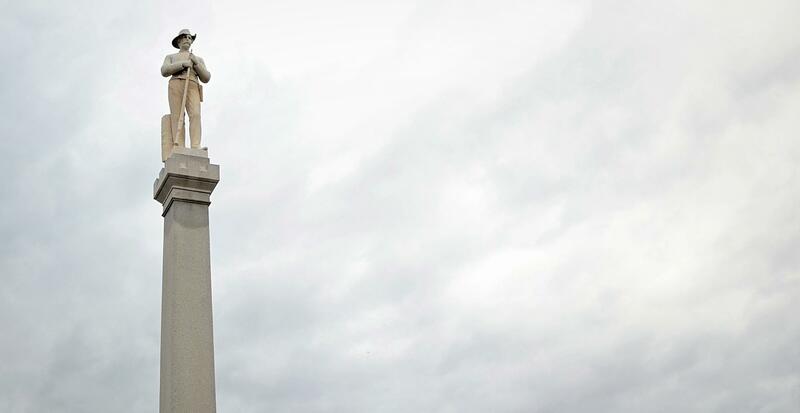 Inside the roundabout in downtown Franklin, the Confederate soldier statue — nicknamed Chip, for the chip in his hat — is perched on top of a 37-foot monument. He was erected in 1899 to honor Confederate troops who fell during the Civil War. Franklin Community Church Pastor Kevin Riggs says he’s irked by the writing on its side, which suggests soldiers fought for a noble cause. "The Civil War was about slavery. If that’s the noble cause they were talking about, there’s a little bit of uncomfortableness in reading that." The Battle of Franklin was a significant moment in the Civil War. The statue, the plantations and antebellum churches here are all popular tourist sites. But Riggs says they fail to represent the history of the nearly 12,000 slaves who lived in Williamson County before the war. 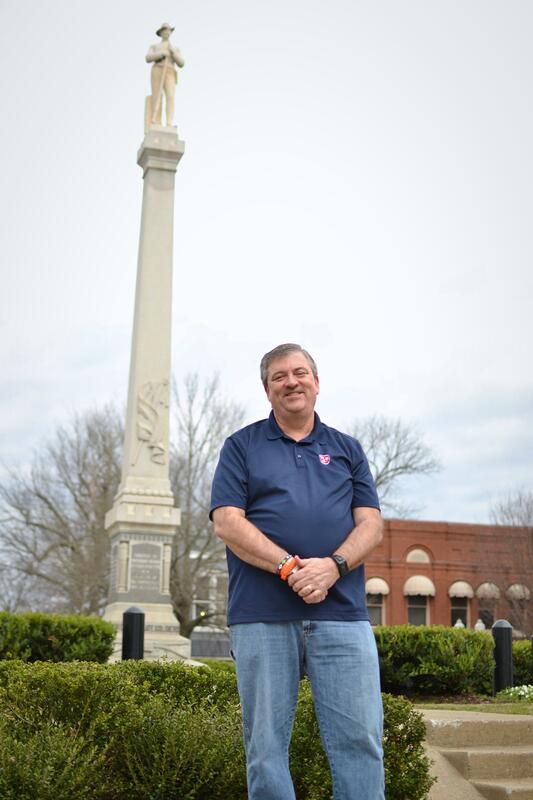 A Confederate statue nicknamed Chip stands in the middle of Franklin's town square. Close to Chip, slaves were sold in a markethouse. Nearby is the courthouse once used for public lynchings. Later, that same courthouse was where slaves could become freed soldiers and fight for the Union. And after the war, many started businesses in downtown. "But none of that is here. People don’t know that story and they need to. All they see is this," Riggs said. "It’s kind of weird to be black in the city of Franklin." Christian Nevils is a direct descendant of a former slave family at the Carter House and farm, which is minutes away from Chip. And, it's one of Franklin’s key attractions. "You feel like you’re overshadowed by the Confederacy. It’s 2019 and everybody is supposed to be different. You get all the tours of the white history, but what about the black history?" Nevils said. He added that he sometimes feels uncomfortable walking around downtown. This sentiment is something Kevin Riggs hears often in his church. It’s part of why he and a few others founded the Fuller Story project. It aims to put African American history markers around Chip. Across from him, there’d be a statue of a free African American soldier who fought with United States Colored Troops. "You see it around the country where people are tearing them down. That’s not what we wanted. Our goal is, 'How can we unify?'" Riggs said. Franklin Community Church pastor Kevin Riggs is a co-founder of the Fuller Story project. Franklin is just one of many places across the country grappling with Confederate monuments and the social tension around them. Over a hundred Confederate statues, symbols or memorials have been removed around the nation, but there are still more than a thousand in existence, according to data from the Southern Poverty Law Center. In some cases, concern around them has even turned violent, like when a group of white supremacists rallied to protect two statues in Charlottesville, Virginia from being torn down. Eric Stuckey, Franklin city administrator, says the city voted in February to support the Fuller Story proposal because it seemed like a strategy that wouldn’t cause controversy. And it was practical, he says, because Tennessee law punishes cities for removing historical monuments. "This is an issue that was brought forward through the community that wanted to see a more complete story told," Stuckey said. "If it’s public property, then we have the responsibility to use the public property in the way that meets community goals and vision." But the approach didn’t meet everyone’s goals. The United Daughters of the Confederacy threatened to sue because it says it owns the land where Chip stands. Doug Jones is their lawyer. "Is there room in history to tell more? Absolutely, the fuller story needs to be told. But not on that little piece of ground," Jones said. He says the Chip statue has been there for over a century. His group believes the property should exist for a specific purpose. "We’re not against the markers, OK? Slavery was terrible," Jones said. "Historically, that little piece of ground right there is about honoring the people that fought at the Battle of Franklin." Groups like the United Daughters of the Confederacy say the past shouldn’t be erased. But, in Vanderbilt historian Richard Blackett’s opinion, the legacy of the Confederacy will never go away. It’s a significant part of the nation’s past, and there are a lot of people in the country who want to respect that history, even if they openly reject racism. "The point is the Confederacy lost the war, but they won the larger cultural battle. That’s why it’s so hard to remove them," Blackett said. The proposal would also put up a statue of a United States Colored Troop next to the Franklin courthouse. A number of strategies have been proposed to address monuments: simply leaving them alone, removing or replacing them, and putting them in museums. Blackett says he thinks the community-based approach of the Fuller Story project is promising, but he’s still skeptical. "The problem with the context of course is there’s going to be a debate about what constitutes the context," he said. Just adding context won’t truly demonstrate the horrors of slavery or help the nation heal from past, Blackett says. That's because the Confederacy and what it represented will still be memorialized in some kind of way. Other cities like St. Augustine, Florida and Raleigh, North Carolina have tried this strategy. But ultimately, he thinks these efforts are Bandaids, not solutions. "To a large extent, it leaves the issue unchallenged because the Confederate soldier is still going to be there." On either side of the debate, Blackett says, someone will be unsatisfied. There are those who want to preserve Confederate history. And there are others who want to erase it entirely because they think the Confederacy represents racism and inequality — which still lives on today. The city of Franklin is proceeding. It’s filed a lawsuit to figure out who actually owns the land under Chip. And for some residents — like Christian Nevils — winning the fight over Confederate monuments isn’t really the point, anyway. "I think it’s just letting people know that we are more than what we’ve been through," he said. "I feel like we’ve worked so hard and haven’t gotten anywhere. Our ancestors worked on this property, and we’re still kind of living on that property." Marlers, he says, will show African American residents in Franklin that they are appreciated for their contributions to the city. And it will ensure the more interesting parts of black history "aren't just left behind," said Nevils, but rather show "that we've come so far and we're still going and reaching." There's a battle in Franklin over the city’s most prominent Confederate monument. Unlike places where statues have been taken down, a coalition of local faith leaders and historical societies has proposed adding new markers to be placed next to the monument that would detail the area’s African-American history. But one group is still strongly opposed. A plan that would make it harder to rename or remove Confederate memorials is on its way to Tennessee Gov. Bill Haslam.